Hello! Welcome to Day 1 of our Gina K. January Release Inspiration Hops! Today we are sharing ideas for my Open Book and Lisa Hetrick's Today and Always stamp sets. Be sure to comment on the blogs as you hop through, Gina will select a winner randomly from the comments on Friday for a $50 gift certificate to the store for some crafty shopping. You are not required to comment on every blog to enter, but the more comments you leave, the more chances you have to win. Let's get to it! I am so happy you all are loving Open Book (and the cat) the way I do! (Wait till you start stamping with them!) First, what's better than one cat? TWO CATS. SNUGGLING! Can't you hear them purring? Stamp the one that will be in the front first (right) cover with your mask, then ink and stamp again to the left. Tada! I was so happy how *purrfectly* this masking turned out, really looks like two different cats, not a the same image! (I'll show in a video how to color this ginger tabby and tuxedo, it's easy!) Base is Pure Luxury Kraft. 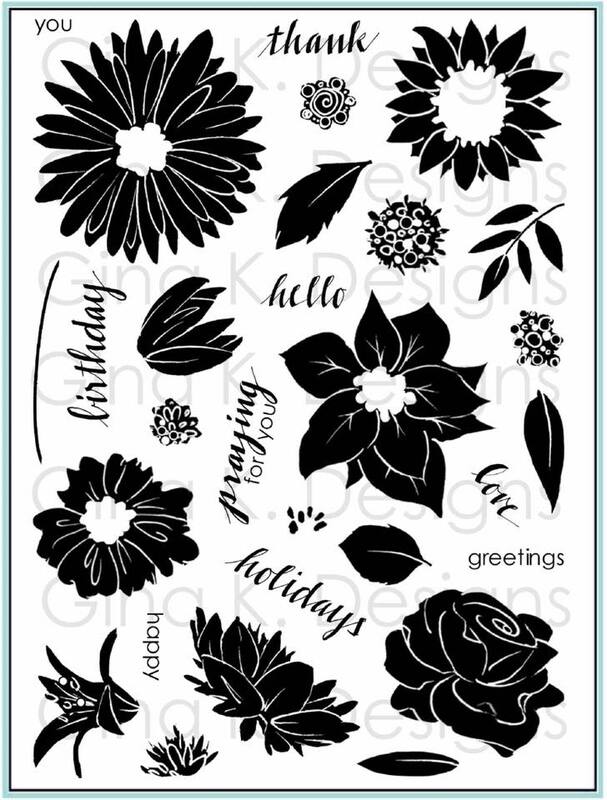 You might choose to stamp "friends" from this set for this design instead of "family", both work .... This pair could even be a fun way to recognize a wedding or anniversary! Meow! 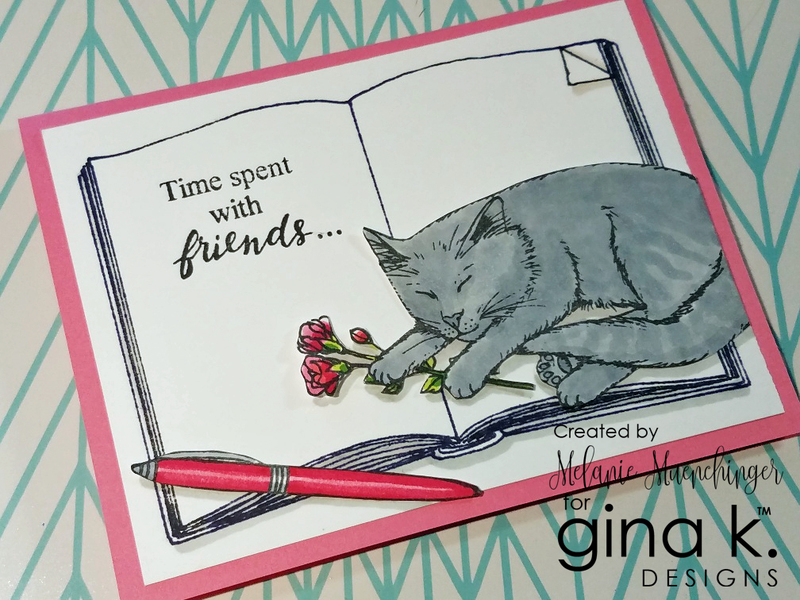 Now I made this card the week before the release just as a sample and for no one in particular, but when I was thinking about what to share today, I realized this was the card to send to my friend who Cat, who had to say goodbye to her beautiful gray Shady Lady the other day. 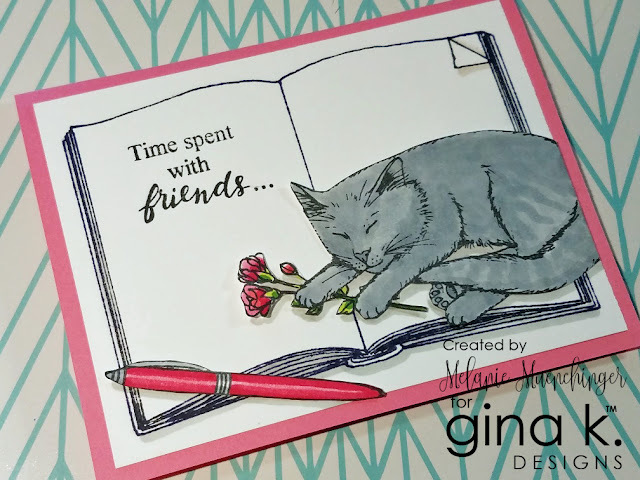 ;( I wasn't thinking about "pet sympathy" when I masked the little bunch of flowers under this cat's paws (cover the cat with your stamped mask and then stamp the roses) or chose to color it gray, but I'm so glad I did. The inside finishes the "Time spent with friends" sentiment: "… is never wasted." I hope this cards reminds her of happy times with her sweet companion. Base is Pure Luxury Dusty Rose. I also stamped the little triangle stamp at the top to dog ear the page. Trace under it for shadow to add dimension. Here is a paper piecing sample using the King James New Testament from the Dollar Tree I recommended in my Facebook Live video. Each page has two columns that fit this stamp perfectly, to have margins on each side and the spine fits in between, allowing one to read it all easily! (I didn't feel weird tearing it out since this inexpensive version is printed on newsprint, and am using it for the express purpose of wanting to use the text (as I surely would feel uncomfortable pulling apart one of my study Bibles. Not doing it!) I stamped the glasses and flowers right over it without masking because I like the way it looks with the words peeping through. I used a yellow marker to highlight one scripture and mounted it on GKD Pure Luxury Wild Dandelion to match. No book or cat for this one, just the words! I thought it would be fun and interesting to emphasize one of the words in the design by circling it (but by no means does it mean I love family, cats or friends less!) Just sharing a bit of passion for your passion, you know? ;) I used a fine line aqua colored pen for checking and circling the words on the list, and colored the pen with alcohol markers to match. Base is GKD Pure Luxury Red Velvet to match the stamped heart. 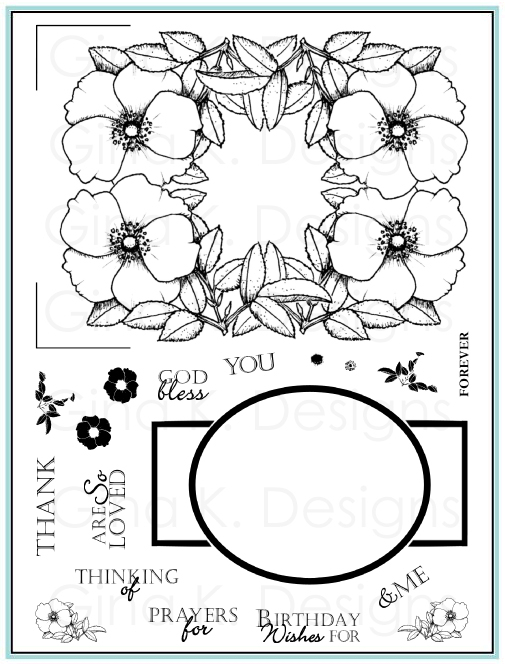 I hope you noticed I put all the books in slightly different orientations, it is small enough to have some leeway where you put it on your card if you are doing landscape style and want to change it up. I better stop there! I showed more than I should have but just couldn't help it, made so many. Still so many ideas to come! (Shoot, I didn't post a card with my bookmark, but I'm sure you'll see it once or thrice in the hop) Be sure to tell me what video you'd like FIRST. I plan to post one later today. Next up we have Lisa's Hetrick's Today and Always. Her "flowy florals" (Lisaspeak, trademark that, Lisa!) are the perfect way to quickly add some beautiful pops of color for an instant modern bouquet (GKD Tangerine Twist, Key Lime, Sea Glass, Turquoise Sea and Pink Passion). The pencils from my Open Book set are cut out and shaded after coloring to act as my embellishments, and those make me feel like I just drew all of this meself on the book! 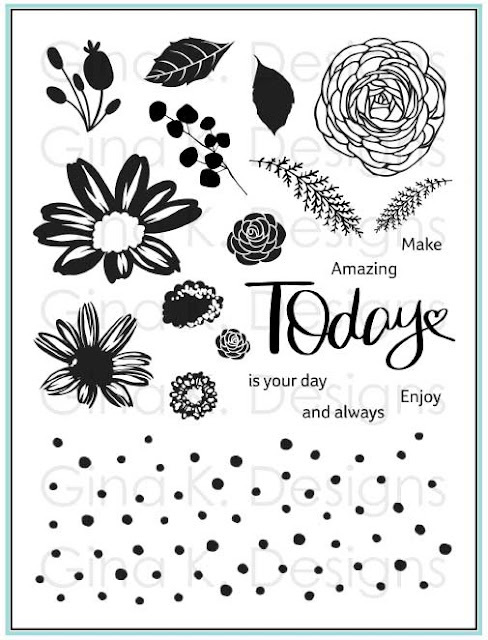 I forgot to take another pic, but I suggest the polka dot border for stamping the flap of your envelopes when you make cards with this, so fun! Base is Pure Luxury Sea Glass. I will have another sample with these two sets in a video because although I kept all the images inside the lines of the pages, I'd like to show a similar design with flowers using a masking technique so they look printed on the page, rather than like sketchbook doodles. Stay tuned! Melanie-Illustrator of Open Book- you are here! Please let me know in the comments section below which of these samples you liked BEST and which video you want to see FIRST demonstrating the technique! (You won't all get your way, but I do wan to know to narrow it down) Thanks so much for visiting today! I love the book stamp. I can see lots of uses for it. The book stamp is on order and can’t wait for it to show up in my mailbox! 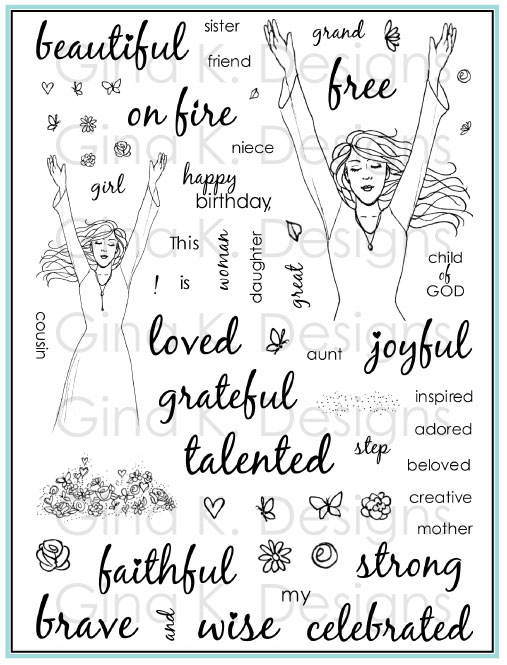 Such an unique stamp with so many possibilities! Love the book stamp...so versatile. Your cards are amazing! Would love to see a puppy dog in a future release!! Retired librarian, here. Love the book stamp and can’t wait for mine to arrive! I liked the one with the dog earred page. That book just seems to jump off the page! Your cards are AMAZING! I like how you shared ways to recycle things to embellish your cards. I love your stamp set. Wow! What beautiful cards. Thank you so much for sharing. http://studioatthelake.blogspot.com/ See the cat on my blog. He makes sound and moves, using you cursor. Beautiful stamps and cards, this set is defiantly a set I must have! Such a unique and fun book stamp - I LOVE the crossword idea - awesome! Stunning cards, the open book is amazing. This stamp set is on my wishlist for sure, all of the new release sets are awesome!! Love this book and cat. Can't look at them too late or my head will be reeling with ideas instead of sleeping. I like the original set. Not sure which card I would like to see featured first, but know I will watch your video and learn something. Great cards! Love the book! Thanks for sharing! I love love love this book stamp! your cards are so beautiful and when my set arrives I hope to try to use some of your great ideas. Hi , I like the sample with the Bible verse in it. What fabulous cards! Love all the sample you showed. Although I'm not really a cat person, the two cats just jumped out at me. The coloring is awesome. A good friend recently had to put her tuxedo cat to sleep and yours reminded me of Daisy. Yikes! I can't believe William is 14. Seems like he was just starting school yesterday. The crossword sample is great. I'm sure he loved it. What awesome stamp sets! I love the Open Book, and especially those kitties! Love the way you colored them! Great cards! My other favorite is your crossword puzzle card! Very clever! Wonderful cards, Melanie! My favorite is the crossword puzzle. Beautiful cards Melanie! I love that your Open Book stamp fits an A2 card. I love the cards where you used word search puzzles too! Loving all the samples but the crossword puzzle caught my eye! What a great design :) Thanks for the inspiration! I love the idea of Open Book. The crossword is wonderful! Love it! Love the book stamp. Anxious for it to arrive. Thanks for sharing your ideas, I never would have thought to use other books with it. love the books and cats! Love books. Love cats. Love this set. Beautiful and fun cards!! BTW love crosswords too! I think all your cards are special, but I especially love the paper pieced card. Love the book and cat...so many ideas of how to use them! wow, Melanie - your cards are incredible - LOVE the cat with the enormous glasses - so funny!! So many possibilities with this set. Love it! This stamp set is beyond amazing!!! 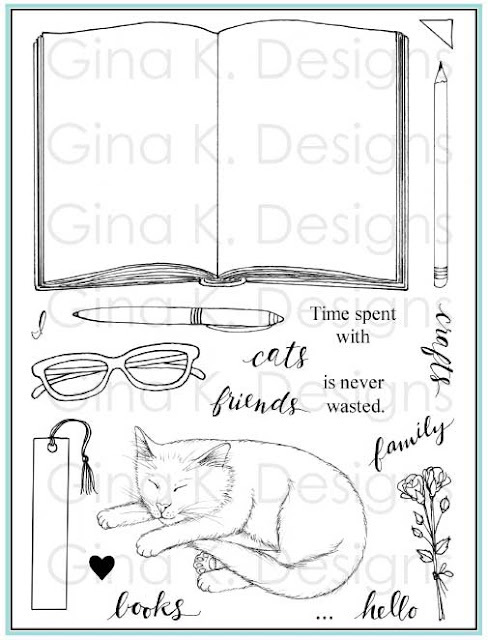 I can’t even say which stamp I love the most...the book...the glasses...the kitty...you have created the most perfect set! And of course all of your cards are gorgeous! Open book!! Ohh...a MUST have for me!! I love your work! Beautiful cards! I wish I could color a cat the way you do. I am totally IN LOVE with the OPEN BOOK stamp set and will order it soon! So many wonderfully creative ideas...Your coloring is exquisite!! Love all the cards - I'm interested in how you make the crossword puzzle one! Melanie, this is your best masterpiece yet! I love it mainly because of the beautiful cat. Yes I am a cat lover. But your examples are gorgeous and I can't wait to see what you come up with next. The idea with the pages from Dollar Tree are brilliant. This is a must set for me. Lisa's stamps are beautiful too. So much to play with. 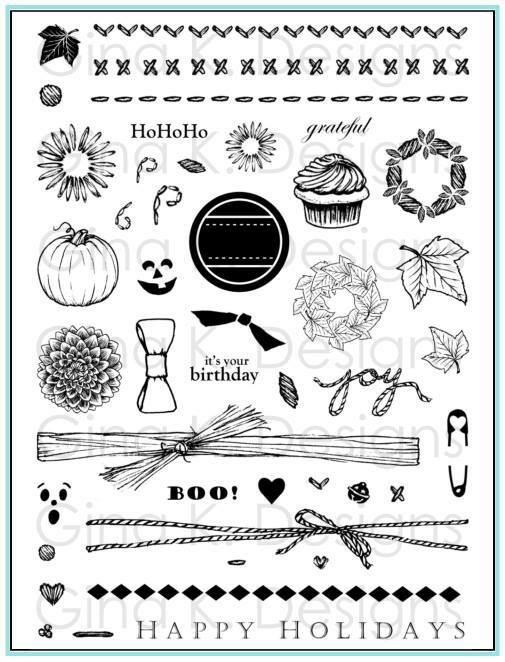 I already ordered this stamp set. I love everything you design. What a fun set with so many possibilities! Beautiful ways of using those stamp sets. I love the cats the way you masked and made two snuggling together. I like the Open Book with the Crossword Puzzle the best and the Bible Background also. I would like to see one of those videos first. 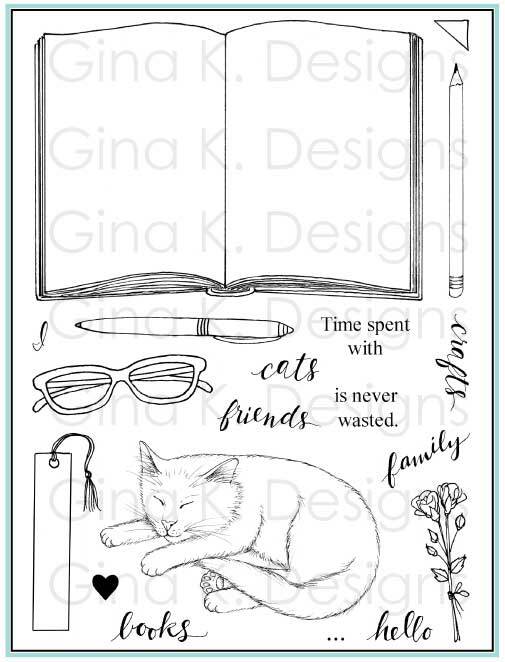 The cat stamp set is cute and I have some friends who would like to get that as a card. 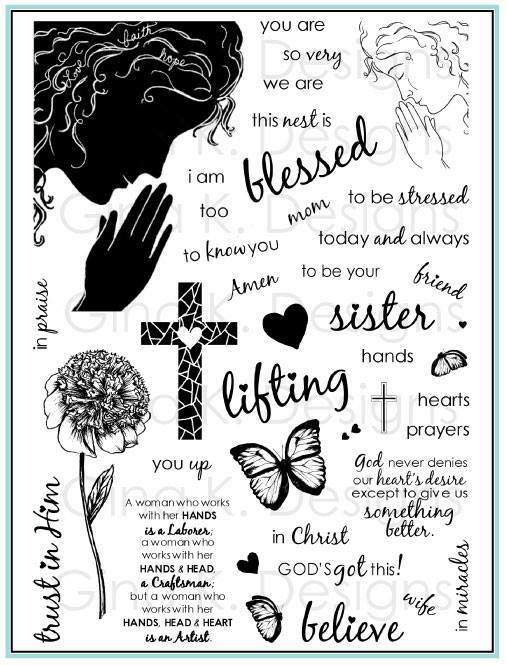 I have ordered the stamp sets and can't wait for them to get here. 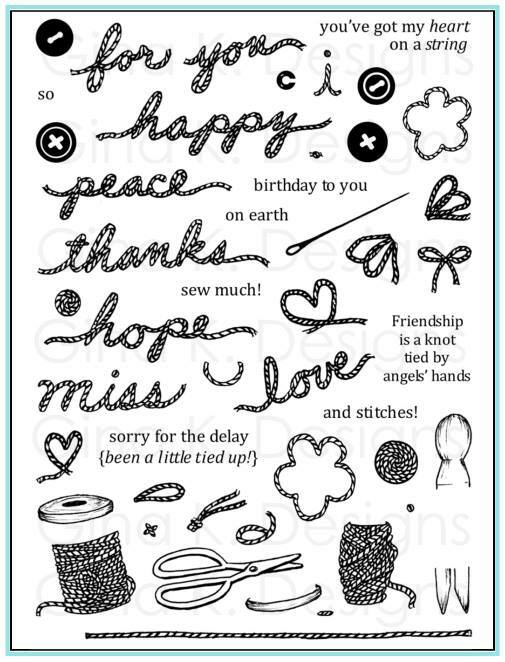 Oh Melanie your stamp set is wonderful and what you did with it is beyond words. The double cat card is stinking cute. Love your wonderful stamps. My fav card is the book with the cat (definitely a cat lover, here). I would love any technique video. What a fun stamp set, Melanie! Your ideas are always so unique! Great cards!!!! I really like the crossword card as my husband does them every day and what a great idea. Would like a video to show how you did it. Love the cat as well. OMG...Love this stamp set! Your cards are absolutely stunning and so inspirational. Thanks for sharing! What a variety of ways to use the stamp set. Love the cats. Lovely cards. I am curious if you used a page ripped from an old Bible or copied a page from the Bible. I can't choose...I love them all! Thank you for sharing all your ideas. I love this open book! The possibilities stress endless! The book and cat together are so cute. I love it! I love the set you designed. I am more of a dog person but the cat stamp is adorable. Great ideas! Great cards--I love books and cats. My fave is the one with the snuggling cats. This might be my favourite set from you to date Melanie, and that is saying something given all your beautiful sets in the past. Love how creative your ideas are! 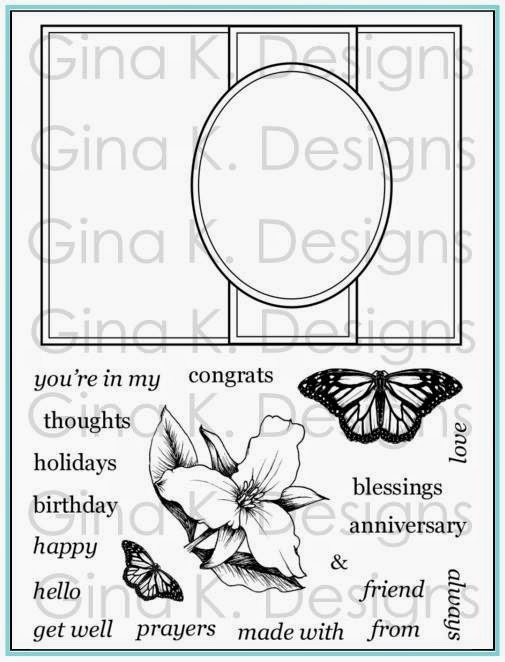 Melanie I have been a fan of yours ever since I got the "Stamping and Card Making Bug" several years ago> I LOVE your stamps, they are so creative and so versatile, which is what I love the most. We get a lot of bang for the buck with your sets. BUT I have to say you completely outdid yourself with this Open Book set. It's totally ingenious!!!! My mind is reeling with so many different ways to use this set, so THANK YOU!!! And i'll be popping the popcorn and sitting on my couch waiting for all your videos that you create for us with different uses! Thank you for your creative spark! And congrats on this latest set. 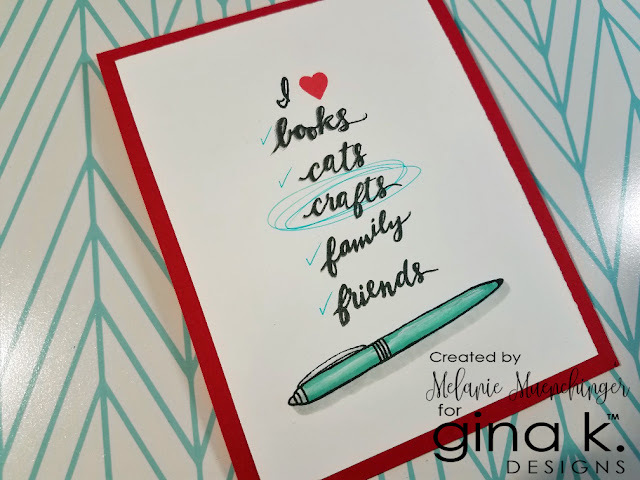 I love all of Melanie's stamp sets and greatly appreciate the wonderful ideas she provides on how to use them. This newest set is great! Oh my, the perfect set for me. I have one sister who loves cats, one who reads all the and was a librarian and roses are my favorite flower. What else could I want :-) . I love your stamp sets, Melanie! This is my new favorite to date. You're cards are beautiful. This cat is perfect for a sympathy card like you made. It's so peaceful. This is the best idea yet! Wish you had a dog too. This is such a beautiful set. I love those sweet cats! I love the cat(s) although I can think of something to do with all of the Open Book stamp set. Great card I think this cute set I love you color too! I liked all the cards, but the crossword was the best. That was totally out of the box!! I have to try it. Such a creative new set and inspiration. Love all these cards! Awesome! Thanks for creating this awesome set Melanie! I'm going to love filling those pages! Beautiful cards, Melanie! Love your new set and your paper piecing tip! So many great ideas. Thank you!! What a wonderful set and such creative inspiration from everyone! These stamp sets just get better & better! The Open Book is one of my favorite yet because of the unending ways you can use it. Thank you for the inspiration! Very creative! Love the cards with cats! I love love love the book set! My favorite is thatbis works well with the other new stamp sets!!! I ordered them ALL. Thank you for sharing your talent with us!! 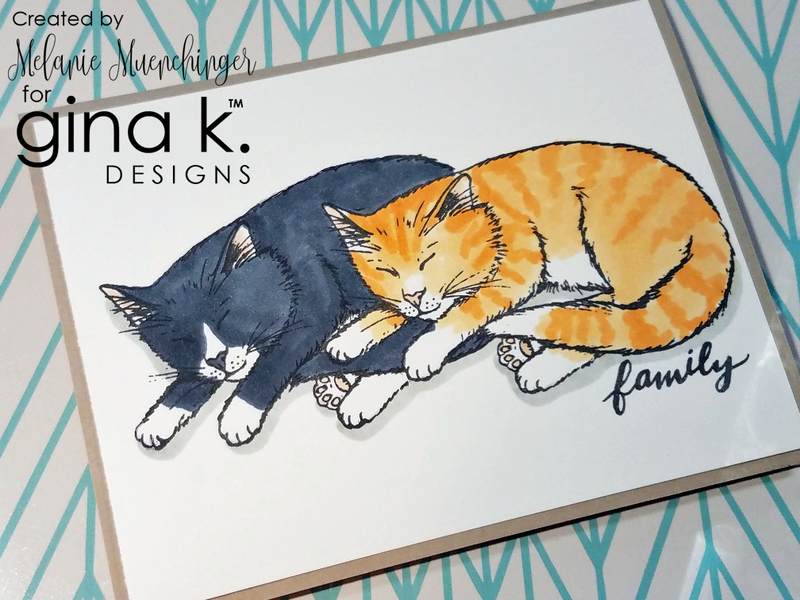 I have an orange cat and a black cat, so your first card caught my eye right away. What an awesome set with so many of my favorites - book, cat, and reading glasses! what awesome uses for these 2 sets ... I love how you did the book in so mays ways!!! totally awesome!!!! Oh my gosh! No way I can pick just one, I love them all. This is an awesome stamp set! The cats are so cute. I think it would be nice to gild the edges of the book; especially for the Bible. Don't know how to do it. There are so many ways to enjoy this new release , extremely creative! Your cards are really clever. I especially love the one with the words and then pen. That was a great idea! Your imagination must be on overtime. 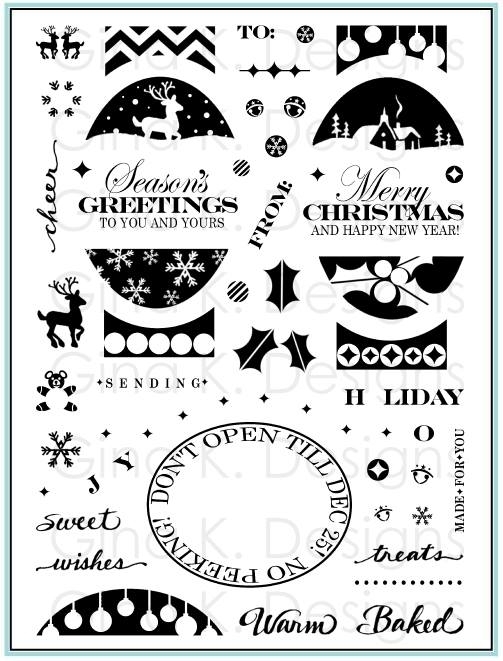 These are so clever and I could have never thought of all of these ideas looking at these two stamp sets. Beautiful! Such creative cards! My favorites are the Bible pages or the crossword puzzle. I used to buy my Elementary kids Bible story books from the dollar store for Christmas gifts. Some of "my kids" still have them! That brought back sweet memories! Thank you for the memories and inspiration! As always your cards are amazing. That cat is most assuredly a keeper, I love it!! I love the kitties! Who knew that a book stamp could be so versatile and useful? Thanks for the inspiration! I love the way your incorporated the bible and crossword pages into the book stamp. So creative! Wow! Beautiful set of cards!!! I'm in love for the crossword pages and can't wait to see the video!!! This Open Book set is amazing! I love what you did with it! And the coloring on the kitties is awesome! So many wonderful ideas for the book stamp. Love them all so any video ia great first. Thanks so much for sharing and inspiring!!! That open book set is so cool! I've not seen anything like it out there with other companies!! What's better than one kitty? Two kitties. Love your cards! The crossword puzzle idea is genius! Great new products, can’t wait to try them out ! LOVE that BOOK !!!! I'd love to see a variety of ways coloring the cats! So love the open book stamp set! Such a fantastic stamp set! So much great inspiration too! I love your combination of your set and Today and Always! So creative! 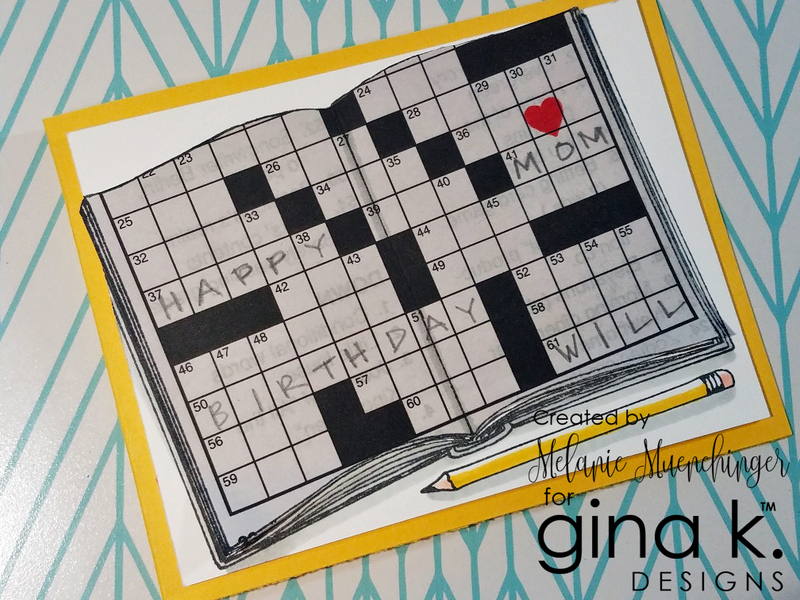 Love the many ways you used the book stamp one of my favorites is the Happy Birthday crossword page! 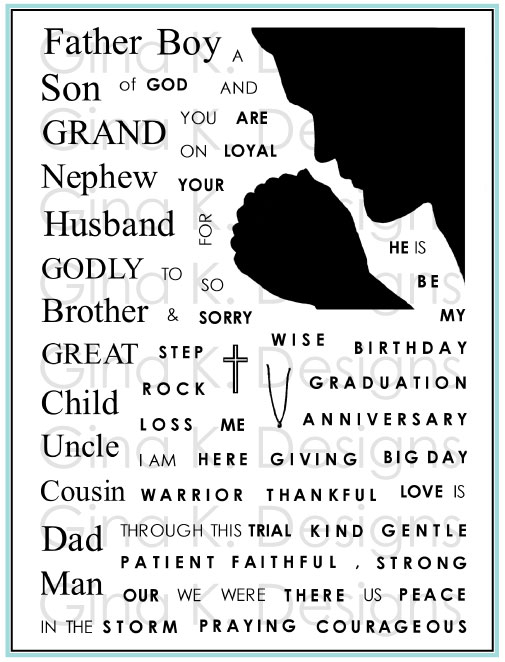 Love your ideas using your new Open Book stamp with puzzle pages or religious testaments! Would be cute to use music sheets for those musically inclined. Endless possibilities! Thanks for showing so many different ways to use the book stamp set. Lots of beautiful inspiration! You've shared so many fab options for using these sets. Thanks for sharing this inspiration with these fun products. As a librarian - your Open Book set is a must have. So many great projects made with it already. Let all your ladies know they are loved! 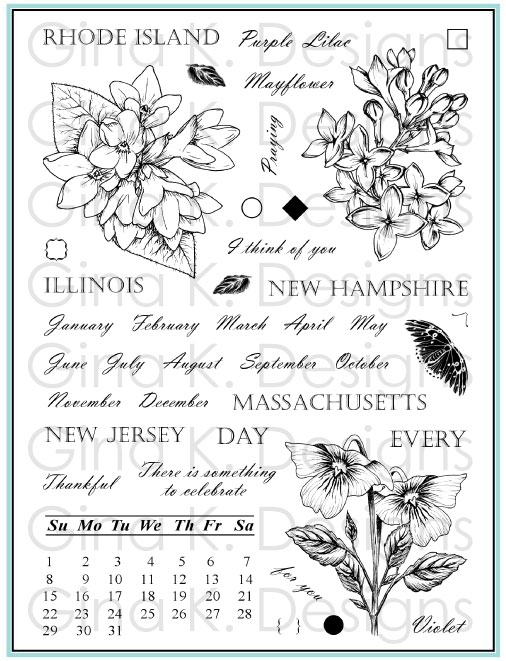 Perpetual Calendar for all your Stately Flowers! Must have with Holiday Frame! For a twine look..in any color! Includes pitcher for all your flowers! Click on this to Purchase, Pin or Like! A whimsical take on the bestseller! 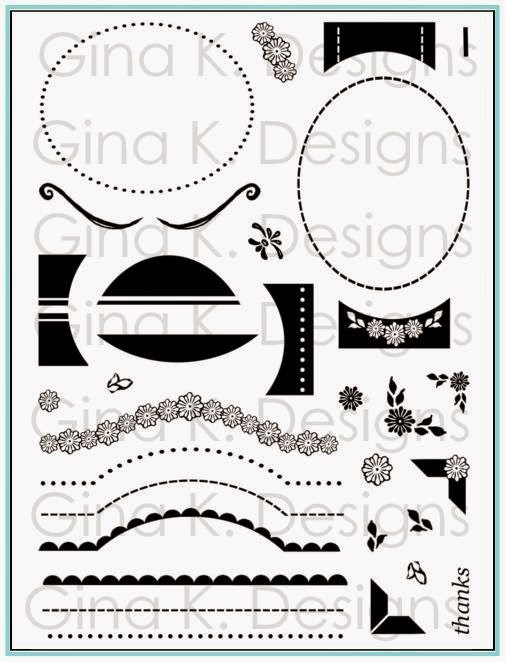 First Alphabet from Gina K Designs. Available in Clear! Just in time for the holidays! Create every card in my book with this set! Go wild with Techniques with "Wild at Heart"
Coordinates with "Wild at Heart"
Coordinates with "Holiday Basket" and"Spring Basket"
Nestabilities friendly, coordinates with "Bring the Bling"
Everything is better with Bling! 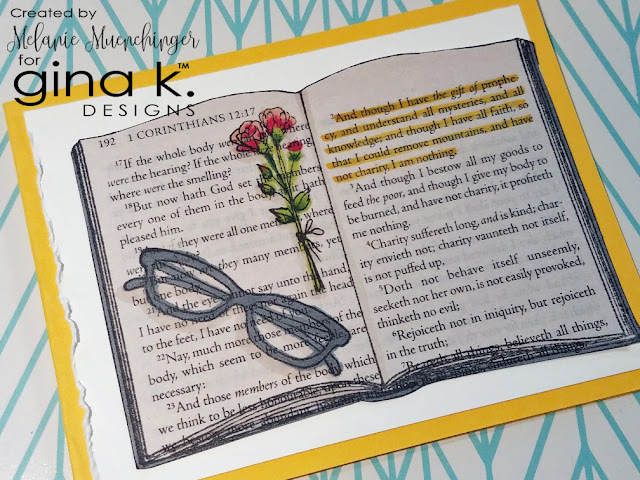 Companion to the new "Spring Basket"
Year Round Elegance with "A Year of Borders"
Coordinates with all my nature sets from Gina K Designs! The perfect match for "A Year of Flowers"! Featured in Cardmaker May 2010 "Our Favorite Products"
"Inspiration Mosaic": The most versatile set you'll own! My Holiday set: "Festive Frame"
Have Fun with "Fun Year Round"
Create a happy birthday with "Candles on Your Cake"
Frame it with " A Beautiful Life"
Fill in your favorite floral sets with "Pressed Flowers"
Companion to "A Year of Flowers"
A "must have" with "Hip to Be Square"
It's "Hip to be Square"
Year Round Nature: "A Year of Leaves"
TIP SHEETS FOR ALL MY STAMP SETS! Cut Flowers: Inside and Out! Onesie Stamped: Front and Back! All Content including, designs, concepts, text, and photographs are COPYRIGHT2018 Melanie Muenchinger. Original artworks are shared for your personal enjoyment only and may not be used for publications (print or online), galleries or contests. Thanks so much for your support! 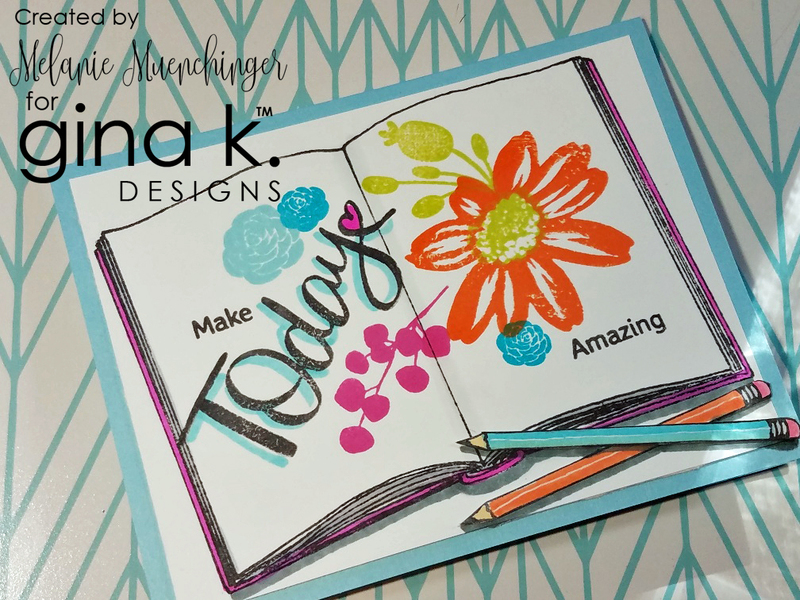 I am a stamp illustrator, author and Senior Design Team Member for Gina K Designs and a WAHM of two terrific boys. I've been stamping and creating cards and other papercrafts for 14 years, and was one of the Splitcoast Original Dirty Dozen Team (melmel). My first book of stamping tutorials came out in January 2012 and the second in May 2013. God has blessed me beyond measure with opportunities to use my gifts and a loving husband who supports my work and art. I pray you find inspiration in the creations and stories I post here! Email me to get this badge for your blog! Becky and Melanie's Holiday Hop! You're Invited: Gina K. Release Party Tonight! My Rock Star Guest Designers!